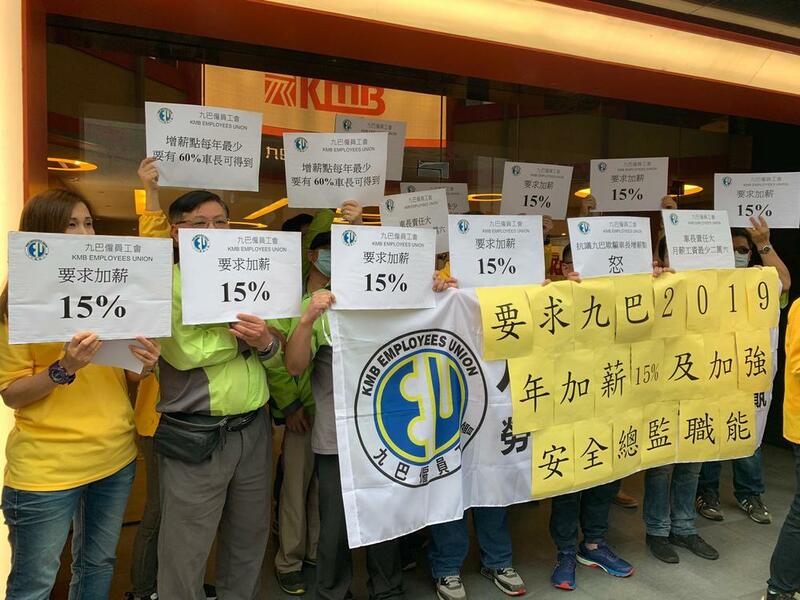 A 15 percent salary increase is being sought for all Kowloon Motor Bus employees from June 1 by the KMB Employees Union. Union chairman Kwok Chi-sing said the bus operator should compensate staff for salaries and benefits that have failed to keep pace with inflation in the past 20 years. The union also called for a minimum salary of HK$26,000 per month for full-time bus drivers. Kwok estimated the average salary for bus captains who work about 10 hours a day is around HK$23,000. Those who work nine to 9 hours make HK$20,000 to HK$22,000, which includes the basic salary and other benefits. Kwok said the basic salary for bus captains is low, forcing them to put in more hours to obtain a higher income. He said some bus captains work 14 hours per day, which puts their safety and that of passengers at risk. Bus captains' welfare and working hours have been under the spotlight after 19 people were killed in a major bus accident in Tai Po last year. Kwok said if the union can't reach an agreement with the company, it won't rule out calling for a third of the routes operated by KMB to be cut. A dozen bus captains held a banner while proclaiming "big responsibility and pressure for bus captains, deceive bus captains about increments" outside the KMB Kowloon Bay Depot yesterday afternoon. The union is calling for salary increments for at least 60 percent of drivers annually and urges that the same salary be provided for identical positions. Kwok said actual salary increases for employees have failed to match the percentage that KMB announces each year. He alleged that the bus operator cut drivers' working hours after approving a salary increase, which decreases their average income. He said the average salary for drivers 15 years ago was also HK$23,000, which is why they are asking for a 15 percent salary increase this year. It is to compensate for inflation and spiralling housing prices. Following the fatal KMB bus accident last year, the government set up an independent review committee on Hong Kong's franchised bus services. The committee suggested that bus firms appoint a director for safety. Kwok said KMB's safety director is powerless. He said the director can't conduct independent operations in terms of safety issues and needs to cooperate in the development of the operations. The union suggested the director directly report to KMB's board and the Commissioner for Transport to effectively enhance the safety of buses.